Read the details here and/or show this to a savvy teen for help! Getting to know another culture often takes months or years of observation and experience. We learn about a culture from watching and participating in daily life: how people interact, what matters to them, what is considered "normal," how they eat, talk, grow up, earn a living, and so much more. XW1W is a way to share the experiences of every day life, teen to teens, so today's young people can grow up with broader experience by sharing with their global peers. See a blog post on how the small details can reveal a lot about a culture. How does XW1W fit into school curriculum? XW1W, a cross-cultural collaboration across the world once a week, fits in curriculum for social studies, world cultures, world languages, geography, and even contemporary issues. If course standards include developing appreciation of other cultures and life in other countries, XW1W fits right in. In the "flat world" of today's global economy, XW1W can even help business, economics, government, or family and consumer science classes discover similarities and differences between cultures. English teachers (native language or those learning English in other cultures) can use XW1W to practice writing skills, as well. Is XW1W for a specific country or countries? Ages? XW1W is intended for teens (age 13+) in any country. Younger students are welcome to participate as a class activity under direct teacher supervision. While many cultures will not be fortunate enough to have access to the technology required, TeachersFirst hopes that XW1W can open some doors in many countries for cross-cultural understanding in the 21st century. Can classes in other countries, like China, join XW1W? Any class, anywhere is welcome to participate, and we hope those who lack access to Twitter will still use this page on TeachersFirst to view the question and respond using whatever tools they have available. Post your responses on a blog and tag them #XW1W. Since Google blog searches will display results over several weeks, you should include the XW1W question you are answering along with your post. Students around the world will be looking for your response! How can a class or student participate in XW1W? Simply bookmark this page or follow @teachersfirst on Twitter to see the weekly question after midnight, early Sunday morning (U.S. time). Share the idea of XW1W with your class, and discuss the etiquette of responding so total strangers in other cultures will understand the response. Have students compose responses on a whole class Twitter account or post them on a class wiki or blog. If students want to go even further, let them create a Glog (online poster) or multimedia project that answers the question using any of the tools reviewed in the TeachersFirst Edge. Your students will already know the tools on their own, so the web is the limit. Use your teacher or class Twitter account to tweet the responses or links to longer responses as tweets with the hashtag #XW1W (capitalized or not) sometime during the seven days before the next question. What kind of responses can students make? The simplest responses are 140 character "tweets" (updates) shared via Twitter with a the #XW1W hashtag. Longer responses could include captioned photos shared on a blog post or wiki, multimedia projects that include sound, images, and text, or even a video. If students work outside of class, they may want to use their creativity to work with a web tool you can learn about, too! Responses could simply be posted on a class web page and tweeted out as a link (with the #XW1W hashtag, of course). Be sure to include what country you live in. Abbreviations are fine! What language should XW1W responses use? Tweeted responses should be in English as a common ground. Tweets will, of course, be in shortened English to fit the 140 character limit. Responses posted on other web locations and "tweeted" in link form should be written in English but can definitely include another language, as well. For example, a student could write a response in English and include a translation into the language of his/her culture or the language of another culture being studied. Creative students might want to use a tool like Voki (reviewed here) to make an avatar that speaks in one language with subtitles in another! Can you show me some sample responses? #XW1W Canada A mess but no cash. See pic:[paste URL or use twitpic]. Need sumr job. How do we see others' #XW1W responses? See recent responses on the Twitter feed or "newspaper" on the TeachersFirst XW1W question page. *See responses-- recent and from past dates-- using this Google search for "Realtime" updates, even if you cannot access Twitter. These updates could include links to longer responses, such as on a class wiki. *See responses written on blogs hashtagged #XW1W using this Google blog search. Use a free tool such as Tweetdeck (reviewed here) to create a Twitter search for the hashtag #XW1W that you can watch on your class computer (if Twitter is not blocked). Savvy tech types can use Twapperkeeper (reviewed here) to collect multiple responses and save them to read much later. Mobile phones even have Tweetdeck-type Twitter search tools so you can monitor XW1W from anywhere! * Works even if Twitter is blocked. Are there any practical tips I should know as a teacher? XW1W is only as appropriate for classrooms as the responses that others write or create. Some schools may have completely open use of Twitter with student accounts while others may not permit Twitter at all. Since teens love to experiment with "creative" responses, you might want to point out to students that XW1W will only last as long as students continue using it appropriately. You can always preview the XW1W responses on this page before sharing them on a projector or interactive whiteboard in class. What a great lesson in responsible use of the Internet! I don't have a Twitter account. Can I participate? You can always READ what other people have to say on XW1W, but that's only half the of the learning. Twitter is free. Why not set up an account to learn more about it? You may or may not be able to "see" it at school. See some of Twitter's advantages for teachers in TeachersFirst's Twitter for Teachers. You might want to share the XW1W project idea with your administrator to gain access to Twitter at school. I know nothing about Twitter. How do I get started? Find the basics at TeachersFirst's Twitter for Teachers. What if I can't access Twitter at school? You can still see the weekly question and a newspaper of current responses on this page. Grab the question to use as a prompt for student responses. Without Twitter access at school, you will want to collect student responses in another online location, such as your class wiki or blog, instead of tweeting them out one by one. Once away from school, log into Twitter on your mobile device or home computer for ten seconds to tweet out the link to the class responses. 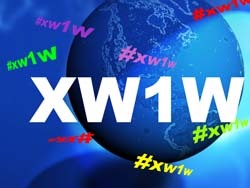 Don't forget the #XW1W hashtag! To see what others are saying-- even without Twitter access-- use Google searches for "Realtime" updates or blog posts with the #XW1W hashtag. Can students participate on their own? Some teachers may want to assign XW1W as an extra credit or homework task if students have Internet access outside of school. Be sure to send a note home explaining the project to parents. Students participating on their own will need their own Twitter account (must be 13 or over). Have students give you their Twitter name so you can "follow" them and see their posts easily to give them credit. Will Facebook Updates show on #XW1W searches, too? It depends. Savvy Facebook users can link their Twitter and Facebook accounts so updates show on both. Many people prefer not to make their Facebook updates show on web searches. Only those who intentionally hashtag #XW1W on Facebook and opt to cross-post their Facebook updates on Twitter will show in the "newspaper" version of XW1W shared here. Is there any control on the appropriateness of responses? Unfortunately, today's social media have no "filters." By publicizing XW1W primarily to teachers and educational technology professionals, TeachersFirst hopes to build a strong group of participants who will model ethical use of the project's great potential. Teachers should preview XW1W results before sharing to an entire class. XW1W will last as long as students continue using it appropriately. TeachersFirst and The Source for Learning, Inc. are not responsible for the individual posts, tweets, or project submitted by teachers, classes, or students and part of the XW1W project. TeachersFirst will monitor the project submissions at reasonable intervals. TeachersFirst reserves the right to terminate the XW1W project at any time if it is no longer being used as intended. Where do we find the weekly questions? Follow @teachersfirst on your Twitter account or come to this page each week to see the new question (add it to your bookmarks!). New questions appear on very early on Sundays (U.S. time) so teachers can plan for the coming week. TeachersFirst will also include the XW1W question in our weekly Update emails beginning in late February, 2011. Sign up for the Update here. What kind of questions are they? Questions are designed to elicit teen-friendly information about daily life that may reflect underlying priorities and circumstances. Topics might include food, clothing, family, school, friends, entertainment, and more. Since culture is made up of many small interactions, these questions will provide a window into what makes everyday life and everyday decision making "tick" for teens in many different cultures the world over. The Thinking Teachers at TeachersFirst, along with our many teacher review team members, Educator Advisory Board members, cultural advisors, and friends contribute XW1W questions. Teachers and students from anywhere are welcome to suggest questions, as well. Can I suggest a question? We welcome suggestions for future questions. Submit them here. Remember that questions must be 140 characters or shorter, including the #XW1W hashtag. XW1W will last as long as students continue using it appropriately. TeachersFirst and The Source for Learning, Inc. are not responsible for the individual posts, tweets, or projects submitted by teachers, classes, or students participating in the XW1W project. TeachersFirst will monitor the project submissions at reasonable intervals. If your XW1W Twitter posts are consistently inappropriate, we will contact you and ask you to monitor students more closely. If you see posts that are objectionable, please report them by copy/pasting the entire tweet and/or the URL for the response into a Contact us (webmaster) email. We will make a reasonable attempt to stop the responsible party. TeachersFirst reserves the right to terminate the XW1W project at any time if it is no longer being used as intended. Thinking Teachers Teaching Thinkers® is TeachersFirst's motto. The Thinking Teachers at TeachersFirst are proud to have developed XW1W as part of our efforts for cross-cultural understanding and participation in the Global Education Conference and ISTE China Technology in Education delegation from the U.S. to China in 2010. Read more about the China trip in the TeachersFirst editor's blog (category: China).